Steve Sue is the product of degrees in design (BA, UCLA) and law (JD, UC Berkeley). This combination lead to a 25-year career as a “hired gun” conceptualist of theme parks, live entertainment productions, corporate events, retail environments, restaurants, product brands, housing developments, hospitality and mega-resort casinos around the world. In his adopted state of Hawai’i, he’s recently known for creating ChefZone, the orange look of Waikiki Trolley and visioning for companies, nonprofits and startups. 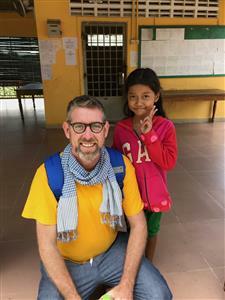 Fellow Rotarian, Brent Beisher has spent half of his life in China pursuing business and friendships. He spends half his time now between Shanghai, China where he runs a property management company and Oahu, Hawaii where he swims and works on saving the Natatorium. He will speak on Monday about the rise of China and the growth of Rotary. Taking back the palace! The restoration of Iolani Palace. Alice Flanders Guild is a Kamaaina of Native Hawaiian ancestry with a record of community service spanning more than half a century. In the early 1970s, she worked with the Junior League of Honolulu and the late Princess Lili'uokalani Morris to found the Friends of 'Iolani Palace. Later, she served as Executive Director and Chairman of the Board of The Friends. After twenty years in advertising and promotion, she became General Manager of Ala Moana Shopping Center in the mid-1980s. During that period, she was recognized with the American Advertising Federation's prestigious Silver Medal Award for service to the community and the advertising industry. She was the first woman elected to the Board of Directors of Central Pacific Bank, retiring from the Board in 2004, after more than twenty years. She is a past YWCA Leader Luncheon Honoree and a recipient of the Junior League of Honolulu Laura Dowsett Award. Her contributions to the arts, historic preservation and education have been widely recognized and she is the recipient of numerous awards including the Punahou Alumni Association Charles Judd Humanitarian Award, the Garden Club of America Historic Preservation Award, the Native Hawaiian Chamber of Commerce O'O Award and the President's Call to Service Award, presented by George W. Bush. Alice has served on the Board of Directors of Child and Family Service, Aloha United Way, The Better Business Bureau, Hawaii Visitors Bureau, Hawaii Community Foundation and Honolulu Academy of Arts (Honolulu Museum of Art). In 1970, she was appointed by George Ariyoshi to the Governor's Conference on The Year 2000. She is also a past president of the Junior League of Honolulu and The Garden Club of Honolulu. She served as a trustee of La Pietra, Hawaii School for Girls for over thirty years, stepping down as Board Chair in 2017. She is currently a director of The James and Abigail Campbell Family Foundation.